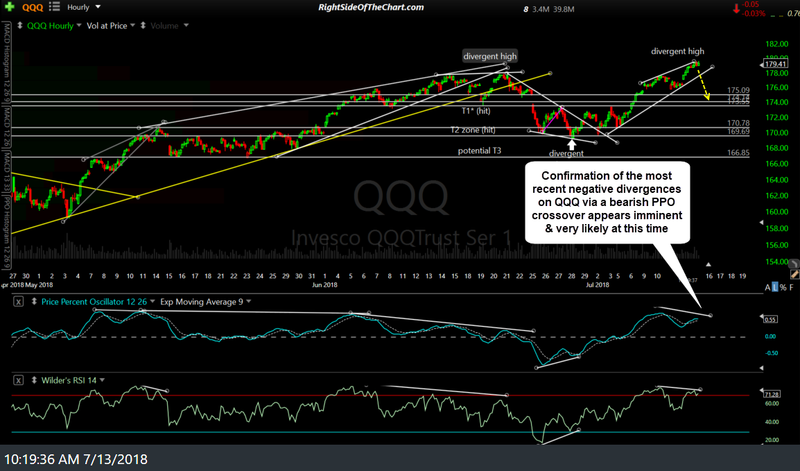 The potential negative divergences highlighted yesterday on the 60-minute charts of NQ (Nasdaq 100 E-mini futures) have now been confirmed via a bearish crossover on the PPO with confirmation (via a bearish PPO cross) still pending, but highly likely, on QQQ. 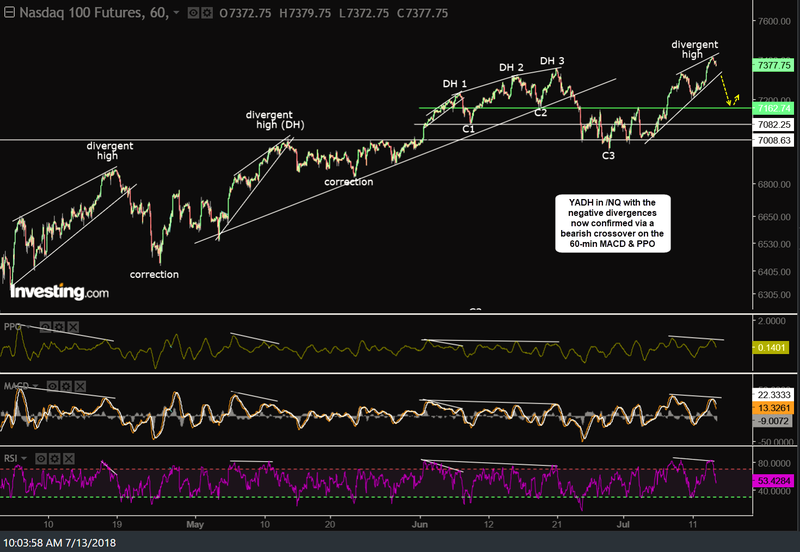 As I still favor a correction to at least the 7163 level & possibly as low as the 7010 level on NQ & with comparable price targets of 173.50 and 169.70 on QQQ, SQQQ (3x bearish Nasdaq 100 ETF) will be added as an Active Short Trade around current levels (~12.49). The current price targets are T1 at 12.87 & T2 at 13.28 with the possibility of an additional price target to be added around the 13.90 area, depending on how the charts develop going forward. The maximum suggested stop (based on the current final target) is a daily close below 12.20 with a suggested beta-adjusted position size of 0.40. 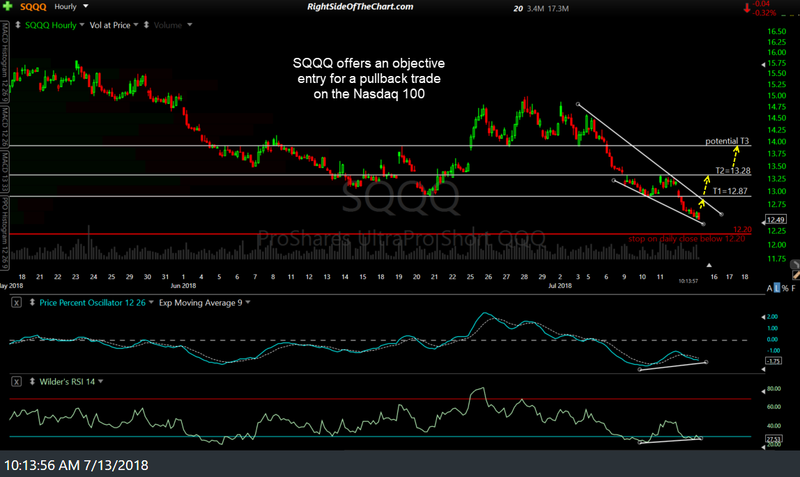 Also keep in mind that although SQQQ is an Active Short Swing Trade, one would buy, or go long, SQQQ to gain short exposure on the Nasdaq 100. Using a long on SQQQ vs. a short on QQQ allows for the opportunity for a pure-play short or a hedge to long positions within cash accounts (non-margin accounts) such as IRAs, which do not allow short selling. Thanks Randy. Cloded my position in TQQQ and FNGU and added SQQQ at $12.47. Best of luck on the trade. I might do a quick video on the top components of QQQ as the potential exists for this to morph into more than just the quick pullback trade that I’m looking for at this time. First things first, though, and that would be to see QQQ confirm the negative divergences soon with a bearish PPO crossover & ideally, a red close today. SOXX also on watch as a potential short swing trade. Randy, if you can make a case, as you just did that the Qs are a good short, you could make an even better case, probably with an official idea on the semis. Just look at how much weaker they are than the broad QQQ index, helped by all these mega cap stocks. While the Qs are at ATH, semis are far from it. Although I have a rather full position in SOXS, I will add to it as a proxy to SQQQ as I think, and you confirmed with yesterday’s video, that there is much more meat on the bone on SOXS than SQQQ. Good Point. Right now, I’m just looking for a relatively quick pullback trade on QQQ & I chose that one because the 60-minute bearish rising wedge patterns on both /NQ & /ES are very well-defined. Obvious, SOXX doesn’t have a futures contract to reference for around the clock trading & the 60-minute chart of SOXX isn’t as clear to me as that of QQQ. With that being said, I am considering adding SOXX as a longer-term swing trade here soon, maybe even before the close today. If so, that trade will have larger profit targets & wider stops. For those familiar with TD sequential, we also have a 13 sell countdown signal today on the daily candles (after yesterdays 9 setup). Very similar to what happened in June on the weekly candles, which was followed by a 2-candle correction. I would expect the next 1-4 days to have an impulse down to the 173.50 target (at least). Thx for sharing both of those Erik. Good to know. Thanks. I’ve heard about DeMark Sequential 13 exhaustion signal, but I don’t know how to read the chart.